The Citizen Kane of Christmas Cat Meme Movies? Release Date: November 29, 2014 – U.S. I love Grumpy Cat. I can't help it. The famous feline's sour expression makes me laugh. Grumpy Cat's real name is Tardar Sauce (their spelling, not mine), and Grumpy's permanent grump is actually an effect of feline dwarfism. However, in the Lifetime movie "Grumpy Cat's Worst Christmas Ever," she's referred to as just "Grumpy Cat" or "Grumpy." Yes, Grumpy is a she, not a he, as most people assume. It's one of the many things the movie pokes fun at. The reason she's so grumpy in the movie version of "Grumpy Cat" is because she's stuck at a pet store and no one wants to adopt her. Poor Grumpy. Grumpy Cat is voiced by Aubrey Plaza ("Parks and Recreation," "The To Do List"). There are a few other animals – most notably a dog, a bird, and a snake – that are also given voices. Ms. Plaza seems like a pleasant enough actress, and maybe that's the problem. Where's the grump? While Grumpy's dialogue indicates that she's in a perpetual bad mood, Plaza's high-pitched voice makes her come across as more of a sarcastic teenager. It's the wrong tone for Grumpy Cat – as least as far as my imagination is concerned. A deeper voice was needed (the late Bea Arthur would've been perfect). Plaza does the best she can, but perhaps making this a "talking animal movie" was the wrong way to go about it? If it were up to me, I would've had all of the Grumpy's dialogue flash across the screen as text, similar to the hilarious memes found online. Then again, a talking animal flick that has more subtitles than a French foreign film might have been a disaster of another kind. Grumpy doesn't say that much though. Am I taking this too seriously? The central storyline actually isn't that bad: A lonely little girl named Chrystal (Megan Charpentier) is looking for a best friend – which, of course, turns out to be Grumpy Cat. The supporting characters and side plots are more hit or miss. The best of these is a seemingly bumbling mall cop played by the underrated Daniel Roebuck, who knows what kind of movie he's in and has fun with it. Roebuck's character is obviously supposed to remind everyone of Kevin James in "Paul Blart: Mall Cop" – but in case anyone misses the similarities, one of the bad guys helpfully makes sure to call him "Paul Blart." Thanks for that! There's also a sad pet store manager. He's in danger of having his shop shut down by the big boss, who looks like an overgrown 15-year-old. The main villains are a couple of idiotic rock band stoners who break into the mall to steal a million dollar dog from that pet store. What the hell did I just type? What follows is an escape attempt through the mall – oddly reminiscent of the 1980s horror cheesefest "Chopping Mall" – and a high-speed car chase, among other things. What? Were you expecting realism from a movie about a talking cat? Grumpy's "imagination" is shown through little skits. In one of them, she envisions herself becoming an internet sensation. In another, "Worst Christmas Ever" turns into a black and white silent film for a minute or two. Clever cat! There is one genuine surprise in the movie that caught me completely off-guard, but then I realized the reason why I was so shocked: because it made absolutely no sense based on what we had seen before. It's easy enough to bamboozle someone when a little thing like logic is thrown out the window. "Grumpy Cat's Worst Christmas Ever" is at least self-aware. It's littered (yuk! yuk!) with in-jokes – such as when Grumpy narrates the logical course of action for one of the characters to take, but then concedes that the movie would be over too quickly if that were to happen. Even the Lifetime network doesn't escape unscathed from Grumpy's grumpiness. When the mother asks the little girl if anyone did anything to her, Grumpy retorts with, "No, that's another Lifetime movie." It's a genuinely funny and witty quip. 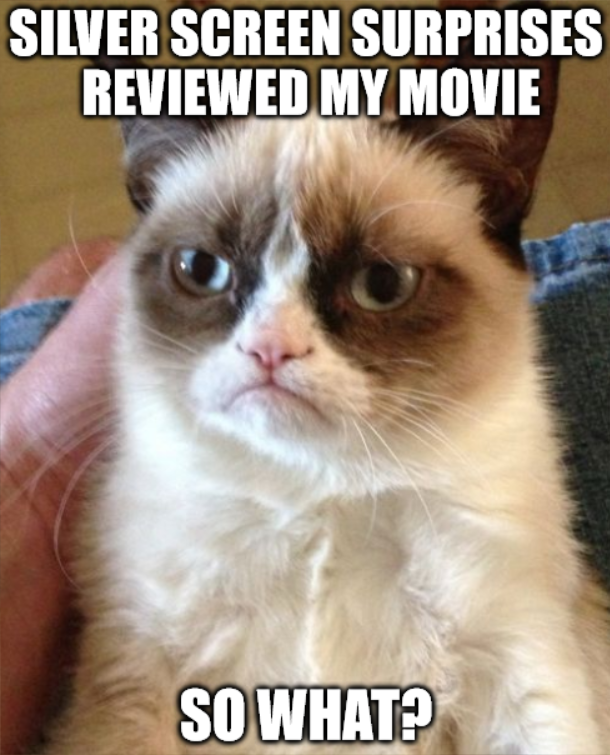 During the movie, Grumpy asks everyone to tweet the hashtag #WhyAmIWatchingThis. Good question. At least two other reviews I found used "the worst Christmas movie ever" in the headline. Not exactly original. (Sorry, Entertainment Weekly. Hire me anyway!) I prefer mine: "The Citizen Kane of Christmas Cat Meme Movies?" Since there's only one Christmas cat meme movie and I used a question mark at the end, it's technically not inaccurate. That and it made me laugh, so I kept it. But is "Worst Christmas Ever" really the worst Christmas movie ever? Not when Netflix is overrun with so much Christmas crap. One of the actual worst – and most offensive – is "A Country Christmas," in which a woman with terminal cancer ends up being cured by Santa's magic powers. If only one kid out there asks Santa to cure Mommy because of "A Country Christmas," it has already caused irreparable harm. Grumpy's cinematic sins seem mild in comparison. "Worst Christmas Ever" isn't the worst Christmas movie ever – it's bizarre, certainly; memorable, yes (in a way) – but is it good? I don't know if I can go quite that far. This is strictly for Grumpy Cat diehards only. I'll confess: If "Grumpy Cat's Worst Vacation Ever" turns out to be a legitimate sequel and not just another in-joke made during this movie, I might – might – watch it. Like I said, I love Grumpy Cat. "Grumpy Cat's Worst Christmas Ever" probably could have showcased its hilarious feline star in a much funnier way, but hey, at least this gives her something else to be grumpy about.